​Spend the day discovering Furnas, where your first stop is a tea factory. After a tour and a tasting we'll continue to the Pico do Ferro Belvedere for stunning views. We take lunch in Furnas Village, located in the crater of an extinct volcano, where we'll try cozido das furnas, a combination of meats and seasonal vegetables. Spend the afternoon at Terra Nostra Park, a splendid botanical garden which is home to thousands of species of plants and trees. The warm mineral springs here are known for their therapeutic qualities, so you may choose to take a dip. Today you’re going to see the remarkable twin lakes of Sete Cidades, carved into a volcanic crater. Enjoy a stroll and make your own discoveries before we take you on a spectacular journey across the island’s central mountain range. After lunch, the ancient village of Bretanha is our final stop, and it’s here that you’ll visit a pineapple plantation and maybe sample pineapple liqueur. Our flight today takes us to the small island of Faial, where you’ll stay in Horta. You’ll see the island’s scenic highlights on an included tour, which begins as we journey along the coast and past the Serra da Ferreira mountain range. Stretch your legs as you take in lovely views of the magnificent bay and natural thermal pools of Varadouro. At Capelinhos you’ll see a mesmerising landscape formed by volcanic eruptions, and your day ends with wonderfully scenic views from Caldeira and the Miradouro da Espalamaca. If you love wildlife, this morning’s optional whale-watching excursion is for you. Firstly, an expert will tell you about the species you might encounter and why the waters surrounding the Azores are home to so many of these magnificent creatures. The rest of your day can be spent at leisure. A journey by boat takes you to the island of Pico today, for a full day of exploration. Highlights include the lava-rock landscape of Arcos do Cachorro and a former whaling factory at San Roque. Take in the scenery as we head across the centre of the island, stopping for lunch in the old whaling village of Laies. Your return route takes you along the coastal road, and includes visits to the Whalers' Museum and the Church of St Mateus. We'll round off the day with a tour and tasting at a cheese factory. After flying back to São Miguel, spend the rest of the day here at leisure. Today you’ll fly back to the UK. To book this tour online click here. Or to request a brochure click here. 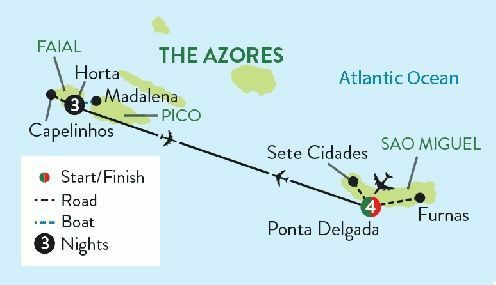 The Azores are a spectacular set of Portuguese islands with glorious sandy shores washed by the waters of the Atlantic Ocean. Known as ‘The Green Island’, São Miguel is the largest of these islands. It boasts a vast array of natural wonders, including volcanic landscapes, hot springs and gushing waterfalls. The island offers the opportunity to traverse narrow, cobbled streets, while simultaneously taking in contemporary architecture and lively cafés – a traditional Portuguese experience with a modern twist. The Faial Island, Hotel do Canal is located on the ocean front of Horta. With breathtaking views over the city bay and Pico mountain. 103 rooms with air conditioning, telephone, cable TV, Mini bar, hairdryer, WiFi, Tea and Coffee service, restaurant and bar. Hotels are subject to change and will be confirmed in your final documents. Brochures requested. Click here to go to the brochures page.